Say it with words. 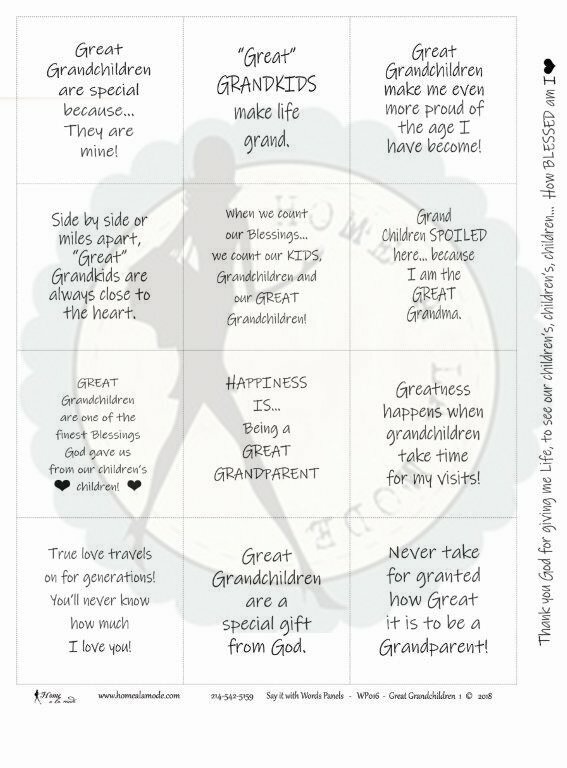 GREAT Grandchildren is a Home a la mode word panel that is all about the serious side of our feelings and the fun learned rules for our Greatest Grandkids... like: Great Grandchildren are special because...They are mine! - "Great" GRANDKIDS make life grand. - Great Grandchildren make me even more proud of the age I have become! - Side by side or miles apart, "Great" Grandkids are always close to the heart. - When we count our Blessings... we count our KIDS, Grandchildren and our GREAT Grandchildren! - Grand Children SPOILED here... because I am the GREAT Grandma. - GREAT Grandchildren are one of the finest Blessings God gave us from our children's children! - HAPPINESS IS... Being a GREAT GRANDPARENT - Greatness happens when grandchildren take time for my visits! - True love travels on for generations! You'll never know how much I love you! - Great Grandchildren are a special gift from God. -Never take for granted how Great it is to be a Grandparent! - Thank you God for giving me Life, to see our children's, children's, children... How BLESSED am I!